Lightly flavoured with cardamom and lemon, these easy to make mini bundt cakes are not only a scrumptious treat but are also kinder to the waistline by being noticeably smaller than a muffin sized bun! I really do have a fondness for the aesthetics of bundt cakes, I thoroughly enjoyed seeing people’s creations during the festive season on Twitter. Their varied patterning always comes through beautifully once the bake is turned out from the pan. And yet, I have only recently become the proud owner of two bundt moulds. One is a traditional large tin and the other is a silicone mould for baking six mini bundt cakes. These mini bundt moulds are so darn cute, I really don’t know why it’s taken me so long to purchase some. A little heads-up for you now……..
We love these mini bundt moulds so much that we have in fact bought another one! It’s identical to the silicone one I used for this bake. The additional mould is going to sit alongside some other items in a little giveaway which we shall be running soon to celebrate the fact that Only Crumbs Remain will be celebrating its first birthday! (Wow, how’s that happened!) There’ll be 13 different items perfect for either the new or keen baker and as such we are calling the giveaway The Baker’s Baking Bundle! So stay tuned and watch this space!! And to avoid missing any posts, including the forthcoming give away, why not subscribe to Only Crumbs Remain, in the box on the right. You can unsubscribe at any point, though I’d obviously prefer it if you didn’t, and you will only receive, via e-mail, the most up to date post I have issued ie/ no spam! So having decided to christen (use) my mini bundt moulds, my next decision was to choose the flavours for the Victoria sponge. Having a couple of lemons left over from Shrove Tuesday (Pancake Day) I decided to use one in this bake. I teamed the citrus notes with cardamom, a beautiful slightly, warming, citrusy spice which works well with lemon. The aroma was wonderful as I ground down the seeds, and was quite a treat once the cooked sponges were removed from the oven. Don’t you just love baking aromas wafting through your home, teasing you, family and friends with the edible delights to come! Being quite a traditionalist , I’ve never actually baked with silicone moulds before but I was really pleased with how easy the baked cakes were to remove from their hollow. 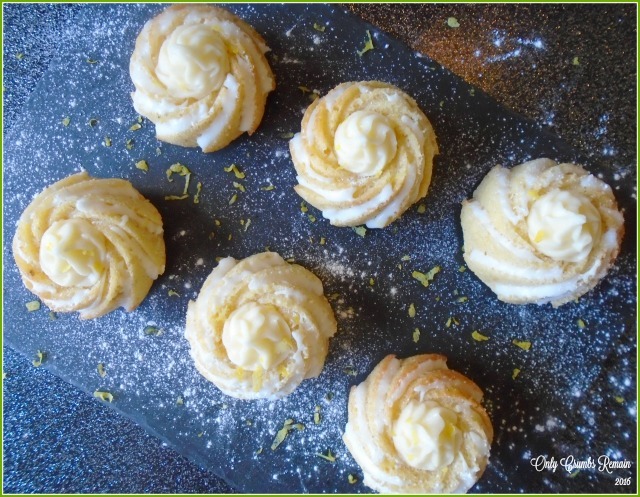 Although the mini bundt cakes looked beautiful as they were with their gentle swirled lines I decided to try to emphasise those creases with a little lemon flavoured icing which I piped on. Even though the mini cakes were good to serve at this point, I also chose to fill their hollow with a little cream cheese frosting. I can’t resist a little frosting! Well, in fact the cream cheese frosting was actually made from goats’ cheese! Having a spare portion of the crumbly goats’ cheese in the fridge, which needed using, and no cream cheese, I whipped it up with some soft butter and icing sugar in just the same way as we would to make a cream cheese frosting. Although goats’ cheese has a slightly sharper flavour to cream cheese, this flavour character only came through marginally. If I was to hazard a guess, I would suggest that most people wouldn’t notice any difference between the two frostings, unless they were perhaps sat side-by-side (a new comparison post perhaps?). Mr E couldn’t pick out the goats’ cheese and I too could barely tell the difference. It really was delicious! So, if I have a spare soft goats’ cheese in the fridge when I want to make another frosting, I know that I can use that rather than running to the shop to pick up some Philli! 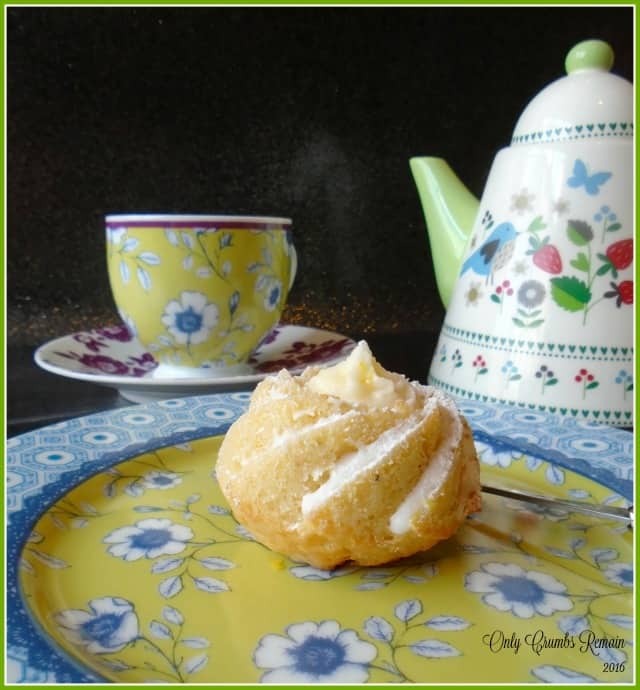 Not only are these mini lemon & cardamom bundt cakes easy on the eye, well they are in my opinion anyway, they are also slightly easier on the waistline too! The quantity of batter I mixed up would usually make 6 good sized muffins, but in this bake I was rewarded with 9 mini bundts! So with 50% more cakes, for the same price, there is more to share around! And should you decide to use some frosting on them, they require only a fraction of the icing which is often used on cupcakes. Now, just because these little cakes are petite and therefore slightly kinder to our waste line, it is certainly not to say that they are short on flavour. Far from it. The slightly warming spice of the cardamom, which worked well with the citrus notes, was easily picked out without being overly pungent. In fact, Mr E, who often refers to his body as a temple and occasionally refuses bakes, went back for a second cake after devouring the first! Do you regularly use silicone moulds or are you a traditionalist and stick to the metal bakeware? Have you ever used goats’ cheese for a frosting? Time: hands on time 30 minutes (if decorating); plus 20 minutes bake time; cooling time. 1. Make the goats’ cheese frosting (if using). Place the butter into a good sized bowl. Beat with a wooden spoon or hand held electric beater until it is thoroughly softened. Break in the goats’ cheese and beat together until combined. Aim to avoid over beating as the mixture can become overly soft. Sift in most of the icing sugar. Use a wooden spoon to combine the icing sugar with the buttery goats’ cheese. Mix well. Taste and add more icing sugar if necessary. Cover and place into the fridge until required (this will give the frosting chance to firm up a little if it has become overly soft). 2. Prepare the bundt mould. Use a small amount of softened butter or margarine to grease the inside of the bundt mould ensuring that you pay particular attention to all of the creases and the smooth cylindrical centre. 3. Pre-heat the oven to 180c / Fan 160c / Gas 4. Place a baking tray onto the middle shelf of the oven. 4. Prepare the cardamom seeds. Extract the seeds from the 3 pods and grind in a pestle and mortar. Alternatively sandwich the seeds between some quality kitchen roll and use a rolling pin to grind the seeds. Open the kitchen roll occasionally to move the seeds around and repeat grinding until they are small and powdery. 5. Make the sponge. Place the soft butter, sugar, lemon zest and ground cardamom into a good sized bowl and beat together with a wooden spoon or electric beaters until very pale and fluffy. Gradually add the beaten egg a little at a time, beating well after each addition. Beat in the lemon juice. Sift the flour into the mixture. Using a spatula or large metal spoon fold this in gently. 6. Fill the bundt mould. Using a teaspoon, fill the moulds with the batter mixture. Alternatively fill a piping bag with the batter (no nozzle required) and pipe the mixture into the bundt moulds. This will make it a neater process. You’re aiming for them to be two-thirds full. (See notes below about the remaining batter). 7. Bake. Place the bundt mould on to the heated baking tray. Bake for about 20 – 22 minutes. You may need to rotate the tray after 15 minutes of baking. Once baked, remove from the oven and place on a cooling tray. After a couple of minutes turn the mould face side down on the cooling tray and carefully remove each cake from the mould. 8. Make the lemon water icing. Sift the icing sugar into a small bowl. 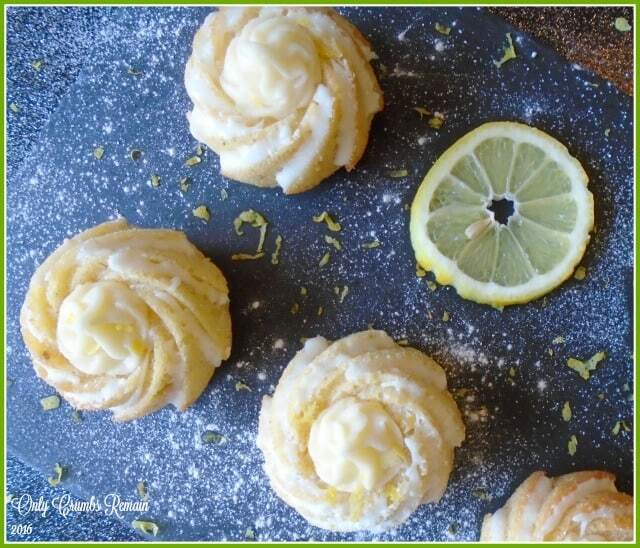 Using a teaspoon gradually add the lemon juice. Mix between each addition. You’re aiming for the icing to be thick enough to hold its shape but runny enough for it to pipe easily. Either spoon the icing into a piping bag (no nozzle required) or a small piping bag made from greaseproof. This YouTube video provides great tutorial. 9. Decorate the bundt cakes with water icing. Once the bundt cakes are completely cold pipe the lemon water icing into the creases of the sponge. 10. Decorate the bundt cakes with goats’ cheese frosting (if using). Remove the frosting from the fridge and beat again for a few seconds. Place your chosen piping nozzle into the piping bag which has had a small amount cut from the piping end allowing the nozzle to fit snuggly. Place the frosting into the piping bag. Fill the hollow of the mini bundt cake with frosting finishing with a little swirl. a) The batter quantity makes a little too much for 6 mini bundt cakes (which is the number usually found in a silicone or metal mould). With the remainder of the batter either fill a couple of muffin / cupcake cases or sit the mixture aside for the initial bake to finish and then use the mould to make some more bundt cakes. This isn’t ideal nor is it usually recommended, but I found that the batter didn’t suffer greatly for waiting the 25 – 30 minutes before being baked. b) The frosting quantity is sufficient for the hollows of 9 bundt cakes to be filled. If making muffins / cupcakes with the remaining batter you may need to make a little more frosting. c) I found it useful to place the wobbly silicone mould on a baking tray whilst in the oven to provide some support to the base. d) Our cardamom pods were ground with the rolling pin and kitchen paper technique (given that I had clumsily broken our pestle & mortar!) and found that with a little patience this worked well. Simply Eggcellent hosted by Dominic over at Belleau Kitchen, who has an ‘anything-goes’ theme this month! oooh mini bundt tins, who knew! Will have to get some of those. 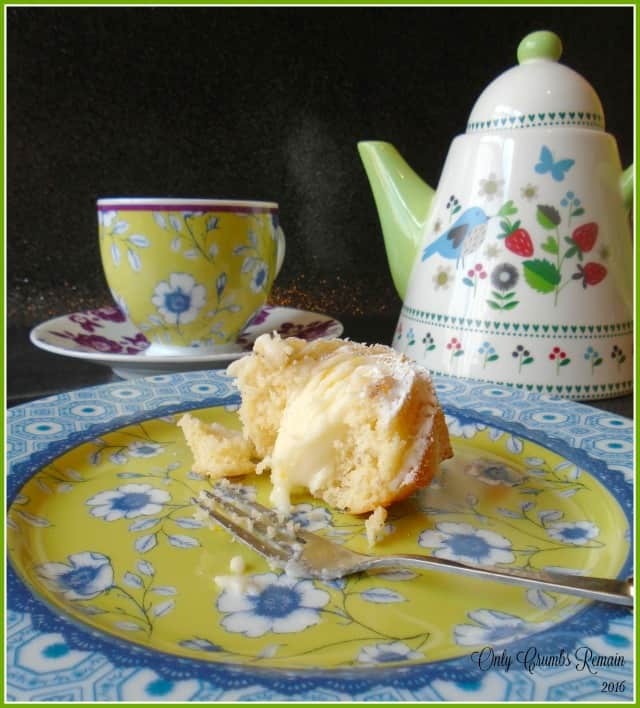 Loving your cakes, they look lovely and I love your crockery as well. They're cute aren't they – you'll have to enter my giveaway – not long before I post it now! The crockery is lovely isn't it – it was a birthday gift which came from Debenhams. Aw thank you Jenny 🙂 You'll definitely have to try the goats' cheese version, there is little difference in the flavour once the icing sugar is mixed in. It's such a summery tea-pot isn't it, though I must admit it's a bit of a pain if I use it for its intended purpose as it's not a great pourer. Angela, your cakes make me so happy. They are always so beautiful and turn out wonderfully well. Please tell me that you had to make these five times to get them looking that perfect. I'm not jealous of your talents at all…. I'm no master baker. I'm definitely more of a cook! Thank you Dominic 🙂 They a great little mould aren't they. These are like the cutest cakes ever! Totally love them. I just got a whole load of silicon baking bits off my gran who didn't like them but I'm excited to give them a shot! Aw thank you Jasmin x I must admit that I wasn't totally sure about them for a long time, but then came to think that they must be OK because they've been on the market now for so long. It was such a doddle removing the cakes from each hollow. Yeah, I know goats' cheese in the frosting, it really works Cathleen! Thank you Eb! I can't quite believe a whole year has passed! I too don't recall seeing many baby bundt cake moulds either – normally just the beautiful (and expensive) large ones, so I knew I just had to get one (or two!) It's not long to the giveaway Eb, just a couple of weeks, so hold fire buying one and with a favourable wind and fingers crossed you may win! Ooh you have to try the goats' cheese in the frosting, there is so little difference really once its mixed with the butter and icing sugar. They really were scrummy Sara, I too can't resist a lemon cake, but those few cardamom seeds really brought a delicious flavour & aroma to the cakes. 🙂 thank you Helen, I can't quite believe that it's almost a year since I pressed the publish button! It's certainly been an amazing 'journey' as they say on Strictly! It's amazing what a bit of shaped tin / silicone does to a simple bake isn't it. I'd love to get some more bundt tins, but to be honest it's where to store them!